In the winter of 1901-2 Mr. St. G. Caulfeild undertook the further examination of the temple of Sety (Seti I) at Abydos (Abtu or Abdju). Our work there resulted in finding the temenos (enclosure) wall, and showing the connection between the planning of that temple and the Royal Tombs of the early kings on the desert behind it. These results, and his careful study of the plan of the temple appeared in the last volume of the research account. But he also made other discoveries which have been followed up during the next winter by Miss Murray with the results here issued in this volume. When Mr. Caulfeild began to excavate, I noticed some thick masses of crude brick, and suggested that they might be mastabas. He cleared along them and found that they formed a continuous wall, which we then identified as the temenos wall of the temple. I observed that parallel with this there was a slight long hollow on the surface, and proposed that he should clear it out. Some time after, on looking at the site I was told the men had found desert a few feet down. This seemed strange, and on looking at it I saw there was only blown sand. So they were told to go deeper. Again, after some time, on going there again, the same story of desert at the bottom was repeated; only this time about fifteen feet down. On examining it I found blown sand. So a third time they were told to go down, and soon after they struck some great blocks of limestone. The final result was that we found the pavement of the hall was forty-one feet under the surface; a depth filled with some Roman rubbish and much blown sand over it. After the excavations by Miss Murray and my wife, we realized that these great stones which we first found were the remains of the doorway to a limestone chamber near the north-west corner of the temenos, which had been entirely carried away for lime burning in Roman times. From the place of this doorway Mr. Caulfeild carried on excavations, continually expecting to come to an end of the entrance passage to the south, and find a door of approach to the subterranean constructions; but after continuing for a couple hundred feet this seemed as far off as ever; and the season being at an end nothing more was done. Miss Murray, then, entered on the work, with the certainty of a long inscribed passage to be cleared and copied, and its terminations to be found. Various attempts were made to settle the beginning of it by surface workings, tracing the filling of made earth which lay over it. And these resulted in showing that it turned at right angles, and led up towards the back doorway of the temple. But it could not be found at it's beginning owing to the immense rubbish heaps thrown out in Mariette's clearing of the temple halls. The work was therefore concentrated on a point where the filling seemed to be undisturbed over the construction, hoping to find there the roof intact, and so enter an unbroken part of the passages. But on descending we found that the filling in had only been left because there was no roof under it there; and the whole of the ancient roofing had been removed, so far as we were able to ascertain, excepting one cracked lintel. Thus nothing short of removing the whole forty feet of stuff over the whole construction can ever clear it. This season only sufficed for the trial working, and clearing the great hall, one chamber, and part of a passage. 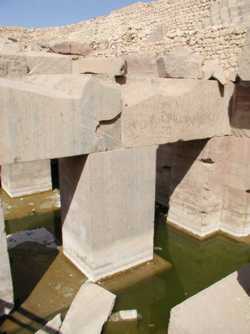 To do the whole clearance is beyond the slight resources of the Egyptian Research Account; and it is much to be hoped that the Department of Antiquities will undertake to open and maintain this unique hypogeum of Osiris as a part of the great temple which is one of the main attractions of Egypt. It was most fortunate that we had the knowledge of Miss Murray and the artistic copying of Miss Hansard available for such a work, which required long and tedious facsimiles to be prepared, with due attention to the inscriptions. The elaborate study of Osiris which Miss Murray has issued will, it is hoped, serve to clear up and emphasize the various aspects and connections of one of the fundamental deities of the Egyptian worship and beliefs. 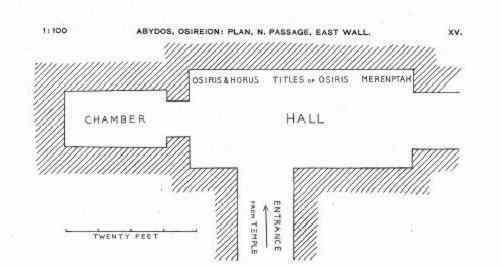 This simple map drawn by Miss Murray shows the floor plan of the Temple of Seti I and the portion of the Osirion she discovered in the 1903-4 season. The entire Osirion is nearly as wide as Seti's temple and includes most of the area between the portion shown and the temple. Section 1. The excavations this year were carried on by Mrs. Petrie and myself (Miss Murray). Mrs Petrie managed the actual excavations, overseeing the men, paying the wages, in short, all the dull and uninteresting, though very necessary, part of the work, whereas I had the more congenial and amusing employment of copying the sculptures. Till the sculptures were sufficiently cleared for me to draw them, I spent my time in the Seti temple, making fac-simile copies of the Coptic graffiti on its walls. Then, when it was possible to draw in the hypogeum, I set to work there, but it was entirely owing to Miss Hansard's kind help that I was able to secure drawings of all the sculpture that we uncovered (with one exception, the sloping passage), before they were silted up. In the previous season Mr. Caulfeild had partially cleared the long passage within the temenos wall; the passage itself had not been laid bare, but the great mass of sand had been removed, leaving a gigantic furrow like a natural ravine. The method of constructing this great hypogeum rendered it comparatively easy to discover that there was building below, though the depth at which it lay made it impossible to clear more than a small portion. The nature of the desert is that after removing from two to four feet of loose wind blown sand, the hard marl, called gebel by the workmen, comes into view. This is so firmly compacted together that it can be cut like rock. The ancient builders took advantage of this fact, and excavated passages and halls with steeply sloping, almost perpendicular, sides. These were lined and roofed with great blocks of stone, and the hollow at the top filled up with sand; the building was then completely hidden from the outside. 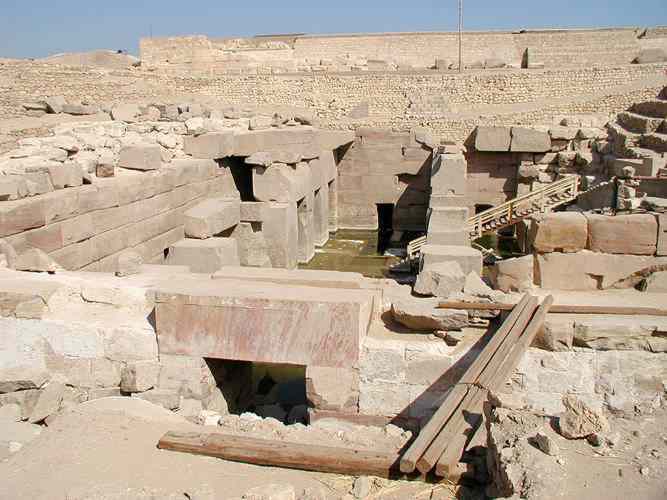 In our clearance it was only necessary to descend a few feet till the rock-like gebel was exposed, and then to follow down the excavation; and the trial pits that we sunk within the temenos invariably showed that the gebel had been cut perpendicularly to admit of building below. We spent three weeks in hunting for a place where the roof still appeared to remain, and we were puzzled all the time at the number of right-angled turns which this extraordinary passage, as we thought it, appeared to make. These turns, as we now know, must be rock cuttings to hold chambers and halls. Finally we decided on a likely place, where the Roman rubbish, which had filled the part already cleared by Mr. Caulfeild, touched the clean marl filling of the desert. Here it was that we hoped to find the place where the roof was still intact. For days I carried candles and matches in my pocket ready to enter the passage as soon as there was a hole big enough to squeeze through; but they were never required. Throughout this excavation it was always the unexpected that happened; we expected to find a passage, we found chambers and halls; we expected to find it roofed in, the roof had been completely quarried away; we expected to find a tomb, we found a place of worship. Our first deep pit brought us into the South Chamber, which gave us the cartouche of Merenptah, and made us realize that we had found a building which has no known counterpart in Egypt. Then came the discovery of the Great Hall and then of the sloping passage. Here our hopes rose high, for the entrance of the passage had an enormous roofing stone still in position; but we soon found that was the only one that remained, the rest of the roof having suffered the same fate as the other parts of the building. I was able to copy only a very small portion of the inscriptions, for though we cleared the passage to the floor, two days of high winds silted it up to the level of the roof. The whole of the excavation was greatly slowed by heavy falls of sand, the Roman filling being so loose that there were continual rivulets of sand running down the sides. A high wind would bring down half a ton of sand and stones in one fall. To sit in a deep pit under an irregular but continuous fire of small stones, with the chance of a big stone coming down too, is an experience more amusing to look back upon than to endure. The rock-like gebel at a distance of about sixty feet from the wall, was cut in a slope like a staircase from the surface of the desert, sloping down towards the wall. Two mud brick retaining walls had been built across it to retain the sand. At a distance of fifteen feet from the temenos wall we found a square shaft (of which the wall formed one side), lined with mud bricks, some of which bore the cartouche of Seti I. The vaulted passage, which we had entered from the other side, ended in a small arch in the temenos wall, and its floor was paved with blocks of stone. We reached a depth of over thirty feet, and came to undisturbed basal sand on which the walls rested. In the vaulted passage the pavement was lifted but with the same result -- undisturbed basal sand. This was during the last days of the excavations, and there was no time to make further research. As to the meaning of this extraordinary shaft I can offer no explanation, nor can I even hazard a guess. The great marl heaps lead to the belief that there is still a large underground building at that end, though our efforts failed to find it. Close up map, by Miss Murray, of the then discovered portion of the Osirion showing the subjects of the wall inscriptions found there. Unlike most monuments of New Kingdom Egypt, the majority of the Osirion is not inscribed. The area she marked as "Entrance from Temple" actually leads to the larger part of the structure, then yet to be discovered. Section 2. This hypogeum appears to Professor Petrie to be the place Strabo mentions, usually called Strabo's Well. He describes it as being under the Memnonium; with low vaulted arches formed of a single stone, by which he probably meant that the stone beams went across the halls and chambers in a single span. 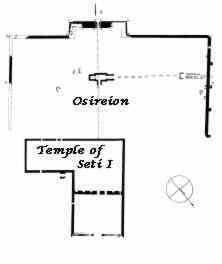 Whether the entrance is really inside the Temple of Seti, thereby leading him to believe that it was under that building, or whether it was entered from the back door of the temple was not ascertained. 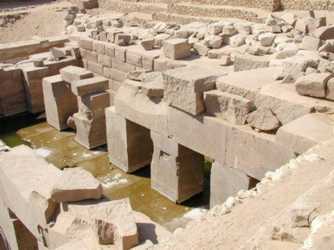 As to the spring which he mentions it might well be that already the lower parts of the hypogeum were then below high Nile level, and that what Strabo saw was the remains of the inundation, which he mistook for a natural spring. Section 3. At first sight there was nothing to indicate the real nature of this building, but later two hypotheses presented themselves. The cartouche of Merenptah appeared in every place where it could be inserted, and we therefore had to consider the possibility of it being his tomb. The two points in favor of this hypothesis are that the walls are inscribed with scenes and chapters from the books of Am Duat and of the Dead, and that Merenptah is called the Osiris and "Maat-kheru". Now M. Maspero has pointed out very clearly that the epithet Maat-kheru can be applied to the living equally well as to the dead. One of his most convincing instances was taken from the Temple of Seti at Abydos, where the youthful Rameses II, destined to live to a very great age, is called Maat-Kheru. I have endeavoured to prove (chap v) that the king, in his lifetime as well as in death, was identified with Osiris. This being so, the fact of his being called Osiris does not of itself show that this was his funeral monument. We must remember also that Merenptah had a very fine tomb in the Valley of the Kings, he was hardly likely to make two of such magnificence. The other hypothesis was that this was the building for the special worship of Osiris and the celebration of the Mysteries, and this appears to me to be the true explanation, for many reasons. Each reason may not be convincing in itself, but the accumulation of evidence goes to prove the case. There is no tomb even among the Tombs of the Kings that is like it in plan, none having the side chamber leading off the Great Hall. Then, again, no tomb has ever been found attached to a temple. The converse is often the case, I mean a temple attached to a tomb; but this, as far as we can judge, is a kind of extra chapel, a "hidden shrine" as the mythological texts express it, belonging to the temple. It is only to be expected that Osiris, one of the chief deities of Egypt, should have a special place of worship at Abydos, where he was identified with the local god. And that it should be a part of the temple dedicated to the worship of the dead, and which had special chambers set apart for the celebration of the Osirian mysteries is very natural likewise. The building lies immediately in the axis of the temple; a line drawn through the temple and the desert pylon to the Royal Tombs passes through the sloping passage and across the center of the Great Hall. This is not the result of accident, the temple being older than the hypogeum, but shows that both were dedicated to the same worship. The sculptures in the Great Hall are the Vivification of Osiris by Horus, and the offering of incense by Merenptah; between the two sculptures is inscribed chapter cxlii of the "Book of the Dead", the "Chapter of knowing the Names of Osiris". The other chapters of the "Book of the Dead" inscribed on the walls were pronounced by M. Maspero, when he saw them, to be the "Book of Osiris". The books of "Gates" and of "Am Duat", which are sculpted and painted on the north passage, were said by the ancient Egyptians to have had their origin in the decorations which Horus executed on the walls of the tomb of his father Osiris. The photographs on this page are from EgyptArchive. 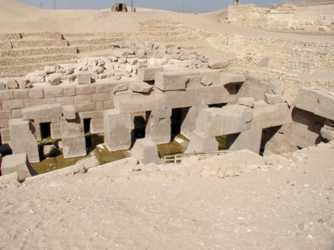 The archaeologists think this temple was built by Seti's grandson Merenptah. It is probable that Merenptah was responsible for the sculptures on the outside walls. But there are no sculptures in the interior of the temple. 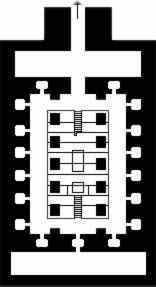 New Kingdom pharaohs like Merenptah filled every available space. 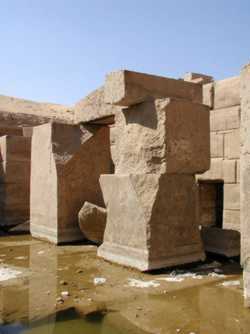 The support areas of the Seti temple are shifted to allow the Osirion to occupy the most important position in the complex. 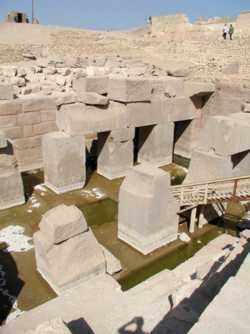 Ramesses II finished his father Seti's temple, his work was mostly in the outer court. Then, decades later his son, Merenptah, built the most sacred part - in the space left for the purpose by Seti? That is not logical. Some would suggest that the Osirion is much much older, that pharaoh Seti located his temple to honor it and that pharaoh Merenptah renovated what to him was an ancient shrine. With its' 60 ton stones, underground location and unique floorplan, the Osirion is most certainly something very different from other New Kingdom temples. What secret ceremonies took place in these strange hidden chambers? Osiris was the god of rebirth, Abydos was his city - perhaps the fertility ceremony each spring was centered here. Like a Native American Kiva, a dark underground space can allow spirit to move powerfully. and with the tombs of the earliest pharaohs: the Seti I Temple at Abydos. an overview of this important ancient city.